Spring is in the air and summer is right around the corner! After teaching over 3 million students to date, we look forward to rounding out the school year by providing continued health and safety education to children, teens and adults in the Tampa Bay area. Look out 4 million, here we come! In February, MORE HEALTH was a finalist in the 10th annual WEDU Be More‬ Awards as nonprofit of the year! We are thrilled that nonprofits across the area continue to be recognized for the life-changing work accomplished in our communities. To that end it is, without a doubt, the leadership and support of our board of directors that enables MORE HEALTH to continue spreading the message of healthy choices and lifestyles. We welcome two new board members Mike Gorsage and Dr. Peter Chang. Also in February, MORE HEALTH director, Dr. Randy Feldman, was honored as a Tampa Bay Lightning Community Hero. He was awarded a $50,000 grant to the charities of his choice. Thank you Dr. Feldman for the generous $10,000 donation to keep children, teens and adults healthy, safe and strong. We look forward to seeing you this fall at the 3rd annual breakfast celebration! Keep your eyes open for our Save the Date! Every day, day in and day out, we use our five senses without a second thought...see, hear, smell, taste and touch. These senses allow us to perceive the world around us. In fact, the brain and our senses are integrated, and work together in processing sensory information about the environment. 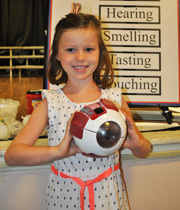 Have you ever thought about how to protect these precious senses? In April we highlight Jeanne Rowe, a firm fixture at MORE HEALTH. 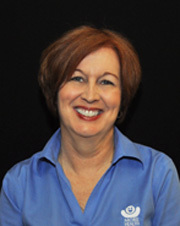 Prior to her beginnings at MORE HEALTH in 2002, Jeanne worked as a substitute teacher in the Tampa Bay area. A rough day on the job and a thoughtful prayer resulted in Jeanne accepting a teaching position, joining friends that were already involved in teaching MORE HEALTH lessons to children, teens and adults. Bones are living tissue (like hair, skin and blood cells) composed of the mineral calcium. These hard-working, rigid organs protect other organs, give our bodies shape and allow for mobility. 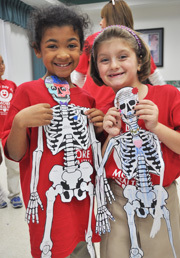 Bones also act as a blood factory in our bodies, making more than 2 million new red blood cells every second! Unfortunately, four out of eight girls and one out of eight boys will develop the disease known as osteoporosis. Osteoporosis causes bones to become porous (full of holes), weak and brittle...resulting in easily-broken bones.